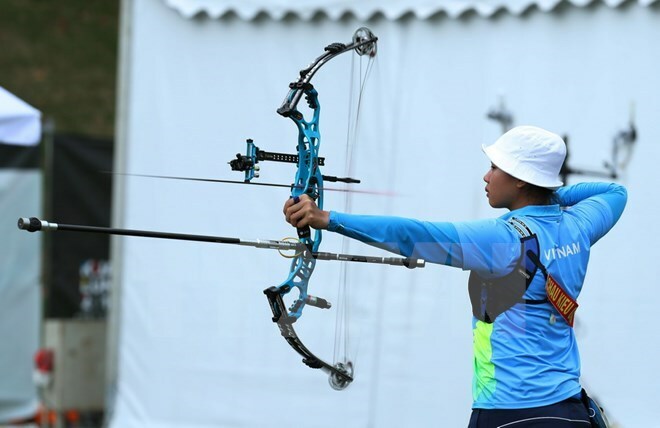 Kuala Lumpur (VNA) – Vietnamese female archers pocketed another silver medal on August 17 after missing out to Malaysian athletes in the women’s team compound category at the 29th Southeast Asian Games (SEA Games) in Kuala Lumpur. Chau Kieu Oanh, Le Ngoc Huyen and Nguyen Thi Nhat Le entered the final round with considerable pressure from the local audience. The competition ended in a tie in the official time and was decided by a “gold arrows” round. However, Vietnamese team lost 27-28 to the host and brought the second silver medal to Vietnamese delegation. Earlier, Chau Kieu Oanh won a silver medal in the women’s individual ​recurve event, the first medal for Vietnam at the largest regional sport event.